The end of the year is fast approaching as is the deadline for the Sketchbook Project! For those not familiar with the Sketchbook Project you can find out about it here or click on the Sketchbook Project logo further on down the page. I have set my own personal deadline to be finished by the end of December. Before I get going about that and what is coming next here is one of my sketchbook pages. This is a small oil sketch from a photo I took on one of my beach walks. Actually I guess one could say I used the photo for reference as much is not included and I changed a few things. When I first signed up for the project a couple of months ago I was very keen on moving onto color in oils as I hadn't got that far when I was in school. I took a bit of time upon receiving my sketchbook to experiment with what medium I was going to use and decided to fill my sketchbook with small oil sketches. I mean, why not combine my oil painting attempts with my sketchbook project? Having little to no experience with oil painting at the time, I didn't realize how long even a small (about 5x8) painting would take. Some days I can only get one done and others about 3 (rarely). That is on the days I work on the project. Other days I work on my art studies. It has been a good learning experience and, a heck of a lot of fun! I decided that I am going to combine the oil sketches (hope to have about 20 total) with some photography, quotes, and information. We were allowed to pick a theme for our sketchbook, out of many. I decided to go with "Down Your Street." I interpreted that as down my street. Down my street (and everyone's really) lies the sea. The ocean is about 4 blocks down my street and a big presence in my life at this time. I walk on the beach daily, no matter what the weather. OK, sometimes I only walk about 50 feet but sand and rain being blown in my face at 50 mph hurts! The ocean is different every day. There is always something new to see. I often stand watching the shapes of the waves, the play of light and shadow, and try to describe the color of the ocean at that moment. The color fascinates me as it changes from moment to moment. Mornings on the beach when the sun comes out are breathtakingly beautiful. There is a lot that breaks the heart too. I always encounter dead sea birds and other marine life. There is also a lot of plastic pollution. The garbage patch in the Pacific Ocean is now the size of Canada. Yes, that is what I said, Canada. I have that info from a Fabien Cousteau presentation given at TED. I love the ocean as it is in my blood going several generations back. I was born by the sea and spent part of my childhood there. I have come full circle with our move to our current place. I do plan to use my future work to promote the cleanup and protection of our oceans. Our "one and only life support system." 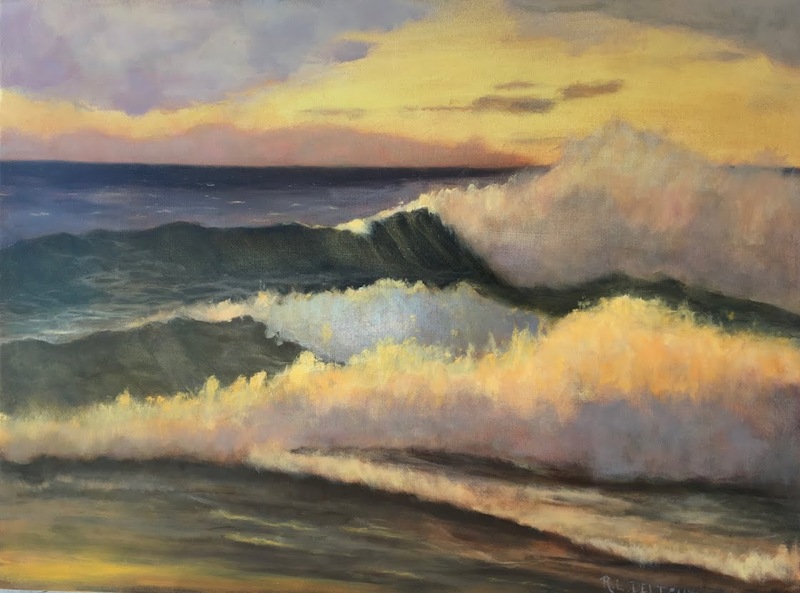 I am learning how to paint seascapes or marine paintings. Since I prefer to draw and paint from life, I am also learning plein air painting. And, as promised, here is a picture of my first attempt completely unedited! First, I have to add that I only had about 2 hours of daylight as this was in the afternoon and the tides were low enough. This was painted at the north end of Short Sands beach, which is just a very short drive up the road. Did I mention that this is my very first attempt, ever? That means I am working with new equipment and conditions as well. 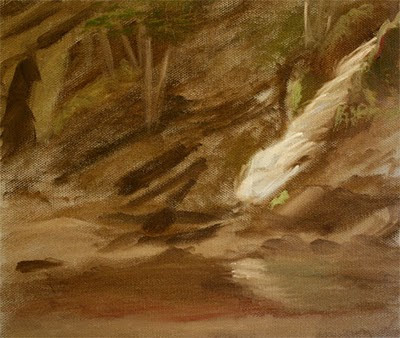 The painting is of one of the waterfalls that cascade onto the beach. I put this up here unedited for a couple of reasons. The first being that it shows my starting place. I know without a doubt that I am going to be improving quite a bit. Secondly, I want to show that we don't always start out as genius artists. It takes a lot of hard work. I figure that I will have the skills I want after about 4 more years of hard, consistent, daily, work. The work to build skill and growth will last the rest of my life. I have a lot of work to do yet. I am still building my figure drawing skills so that I can paint the portraits of women I want to paint. I am not much into painting still life. I do love to look at still life paintings. However, it has its place in skill building so, I will be painting still life for study purposes. That brings me to my final mention. I wrote a mention about a personal challenge in my last post. I will be posting on that in a few days, at the winter solstice, in a special post. This is long enough. Sometimes it seems that I can't get everything in I want to say! Look for my special post on Tuesday or Wednesday. Oh I love your first attempt at plein air. 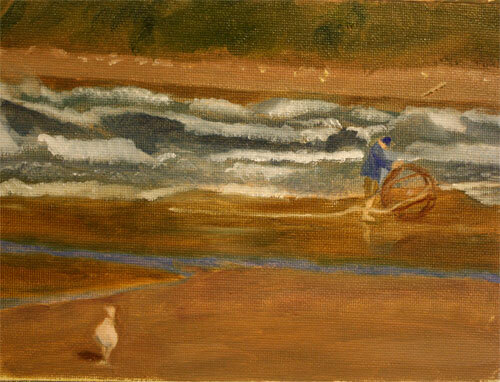 And the beach oil sketch is fab. Good job. Love the colors in it. Painting seascapes, good seascapes is terribly hard I would imagine. what a lovely oil sketch! I really love your oil sketches! They're so full of life. :) And I love to hear about artists setting goals and working on their skills. It's so inspiring! Thank you all for the lovely comments. I am finding painting to be a joy.